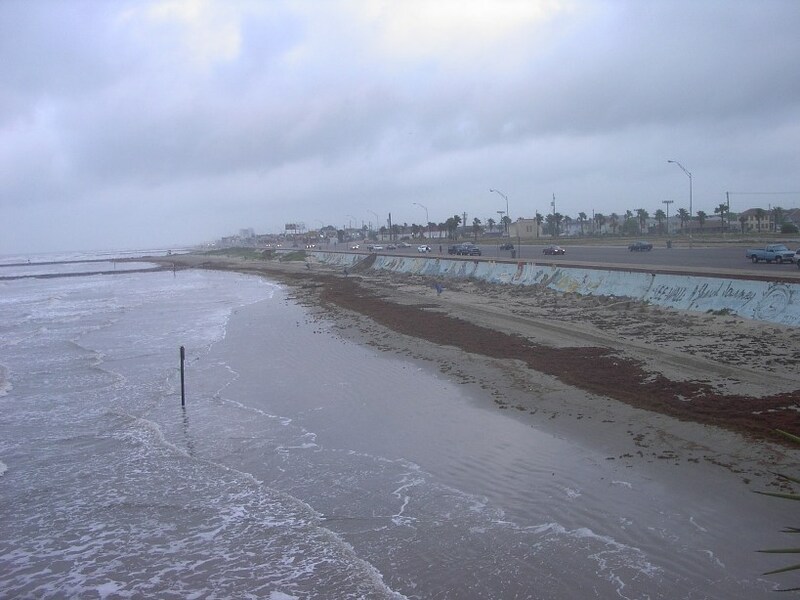 Seawalls, revetments, and other structures have eliminated ocean beaches even at low tide in a few locations, and narrowed the beach in many areas to the point where there is little or no dry beach at high tide (see Photo 5). When a seawall is placed between homes and an eroding beach, eventually the eroding shore reaches the seawall and the beach is eliminated. The elimination of estuarine beaches is so commonplace that several communities with Beach in their names no longer have a beach. Photo 5. Galveston Seawall. (May 2003). Photo source: ©James G. Titus, used by permission. The importance of recreational beaches has led most coastal states to replenish some eroding ocean beaches with sand dredged from nearby shoals, or transported by truck from inland sources; this activity is known as beach nourishment. Several states have also enacted rolling easement statutes and regulations, which prohibit seawalls, revetments, and other hard shore protection structures. Because beach nourishment is a type of shore protection while rolling easements facilitate retreat, the combination of both approaches does not necessarily put a community onto a long-term path toward either retreat or shore protection. But together they ensure the continued existence of a recreational beach more effectively than either approach by itself: the rolling easement prevents the beach from being squeezed by a seawall at the landward edge, while the beach nourishment offsets erosion of the seaward edge. Indication whether beach nourishment and adding sand to dunes are allowed. The relative importance of these features is different for ocean and bay shores. Photos 6 to 8. Retreat. Houses along the shore in Kitty Hawk, North Carolina, where regulations prohibit seawalls. Geotextile sand bags protect a septic tank buried in the dunes. Homes stand on the beach until the septic system fails. Top: June 2002. Middle: October 2002. Bottom: June 2003. Photo source: ©James G. Titus, used by permission. Along ocean shores, at least seven states prohibit seawalls (and other shoreline armoring). Some flexibility is often necessary for homes left standing on the beach after the dunes erode out from under them (see Photos 6 to 8). 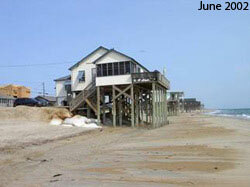 Such homes are hazards and impair public use of the beach. Yet if they remain useable, officials find it difficult to order their demolitionespecially if the houses are still on private land, or if the beach is likely to be restored through natural or artificial processes. A rolling easement can require a home to be removed once it encroaches seaward of the dunes or once the land on which it sits is flooded at high tide; or it can provide for a waiting period during which the beach might be rebuilt or relocation of the home can be negotiated. Actual removal of the house may be precipitated by other factors: Erosion may leave a homes septic tank inoperable (see Photo 9), for example; or storms may destroy the home. A stricter form of rolling easement is to ban all forms of shore protectioneven beach nourishment and other nonstructural shore protection. Along ocean shores, beach nourishment generally occurs wherever funding is available, based on the assumption that adding sand to a sandy beach protects private property while preserving the communitys most important environmental asset: the beach. In a few cases, ocean beach nourishment projects have been stopped because of their environmental consequences. And along estuaries, beach nourishment can significantly alter the coastal environment.If beach nourishment is impractical or undesirable, or if continued shore erosion is an essential policy goal, a rolling easement can prohibit all forms of shore protectionincluding beach nourishment. See, e.g., CCSP, supra note 3 , at 90 (photos along the Texas coast). See also photos before major beach nourishment projects at Miami Beach (FL) and Sea Bright (NJ) available from the Corps of Engineers. See, e.g., David A. Fahrenthold, In Maryland: Eco-Bills Come Due at Bay's Beaches, Washington Post, March 19, 2009 (Dares Beach, Columbia Beach, Mason's Beach, and Scotland Beach) and Josh Harkinson & Kate Sheppard, Buh-Bye East Coast Beaches, 35 (4) Mother Jones 40 (July 2010) (Chesapeake Beach, Pamlico Beach, and Tolchester Beach). See, e.g., CCSP, supra note 3 , at 92 & 102. See, e.g., infra notes 352 & 355. See infra notes 352 & 355 and accompanying text. CCSP, supra note 3 , at 165166 & 202. E.g., Surfrider, Inc. v. Town of Palm Beach, Florida. Florida Division of Administrative Hearings Decision #08-1511 (Department of Environmental Protection Administrative Order #09-0729, July 15, 2009) (denying the town a permit for beach fill because of the project's potential to harm environmental and recreational resources). Jeroen Speybroeck (and 12 others), Beach Nourishment: An Ecologically Sound Coastal Defence Alternative? A Review, 16 Aquatic Conservation: Marine and Freshwater Ecosystems 419435 (2006). E.g., because a species depends on an eroding bluff. See infra note 286 and accompanying text.